At SES London I talked to the team of Linkdex. They wanted to show me their new tool. To be really honest: many people want to show me what they’ve built so they hope I will blog about it. In some cases I get pleasantly surprised in other cases it is hard for me to hide from those who want free promotion for a sucky tool. In this case that was different. It became clear very quickly that Linkdex had built something which could be very useful for many search marketers out there. Linkdex offered me the opportunity to play with the tool for a while. I found that the tool is very useful and has a lot of potential. Below you can read my findings and review of the tool. At the end of the review you can sign up to be one of 50 to try out the tool. Linkdex is no ordinary tool which helps you look at your back links and makes you work on your linkbuilding. Only a short period of time with this tool shows you the name is wrong: it is not just about links, it is about optimizing your website. The tool helps you do that. You can turn on the “SEO Assistant” and Linkdex will help the website owner optimize their pages. By links but also by other SEO-factors. Linkdex in some cases reminded me of something I used to be in a past life: a project manager. I’ve often wondered when I got into search why project management was neglected so much in search. It seemed as if everybody was just doing their thing without thinking of planning, control or even todo lists. Why for example do you never see a session on project management for SEO on a search conference? That probably was because the SEOs I knew were good at what they were doing and had their own way of doing project management. They didn’t need it. But with the growing market, search becoming more “a business” instead of something which a geek is doing in the attic, project management becomes helpful again. And Linkdex recognized that. The tool is full of features which help you manage what you should do on your SEO. Not just when it comes to linkbuilding, but SEO in general. 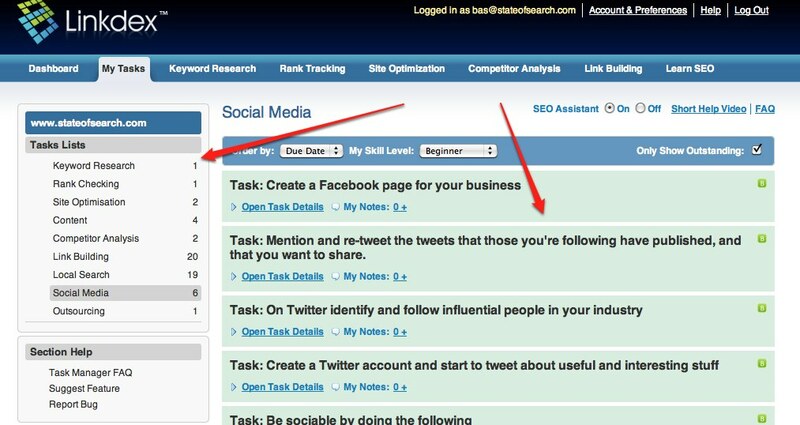 The “Task- manager” section shows what open tasks you have for for example your keyword research, your optimization in general and even your social media efforts. These tasks can be “made” by you as a user, but several of these tasks are “pre-installed” by Linkdex. It helps you figure out what things you have to do to get the right rankings. 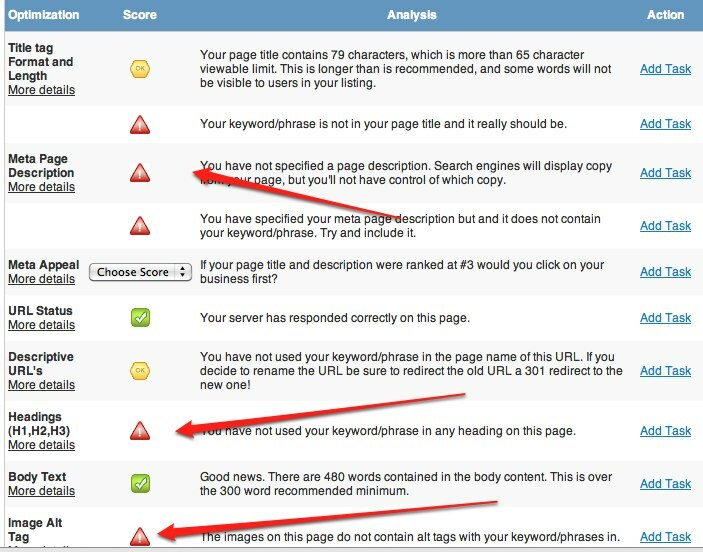 Within the “Site optimization” area you can see an overview of your keywords and pages which need optimization. You then get help from Linkdex. It shows you what you can do to make the chance that the pages rank better a lot higher. The optimization score for example shows that in this page needs work on the meta description but also on the headings and image alts. If I want to work on these items I can add them to my task list. Like many tools you can do keyword research within the tool. As with for example the Google Adwords tool you can put in terms and get back keyword suggestions for a specific region. There are not that many regions which you can choose from, but the important European ones and the US are there. It would be nice to combine a few of them. You get an average of number of searches monthly (I think /hope?) for the past 12 months and when there is enough data you get last month and the number of competition you have. The nice thing is that you can immediately add a keyword to your “to track” keyword list. One nice thing about Linkdex is its competitor analysis. You can look at your competitors and see what they are up to and where they are doing better than you are. That is not just on links and number of links, but for example also on site types. 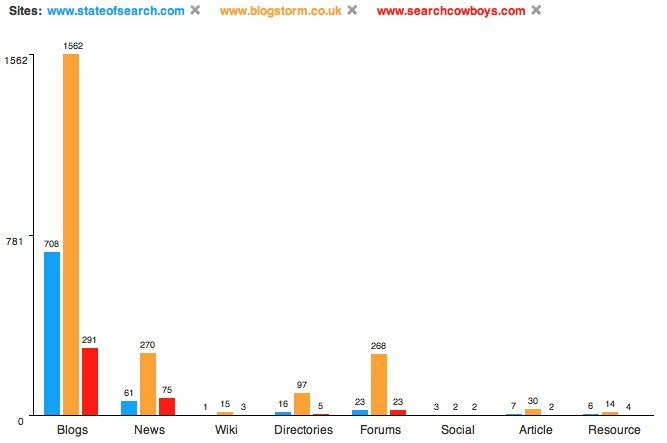 As you can see in the graph below I looked at Blogstorm, State of Search and Searchcowboys. I looked at these sites, because I don’t feel we are competitors but we do act in the same industry so it gives you a nice insight into what I am talking about. As you can see Blogstorm has the most links, which is not surprising since they have been here the longest. But you can also see where they get the most links. As you can also see blogs, forums and directories are a lot better used by Blogstorm. But if you look at news for example you will see that State of Search is catching up there, since we’ve only been in Google News for a month now. Linkdex let’s you check your rankings for specific keywords. That is not a new feature compared to other tools, but Linkdex does do a couple of interesting things here. First or all it shows you the timeline in a nice graph. It is not just x-places up or down over a specific period, it shows you the different steps you are making. Second there is the page for which you rank. “I want to rank for this or that keyword”. Sure, but for what page? You might think one page is important for you but you might be ranking on another one. Linkdex looks at which page you are ranking for and if it can’t find it within a reasonable number of pages you can also fill in your own page which you think you should be ranking for. The link building part of this tool is off course one of the main reasons to use this tool. Just look at the name. Within the link building section you can see several things. Off course you can see who links to you and your competitors. Linkdex uses Majestic data for this. What is interesting is that it is divides the links in possible places where you could be working on to get links: Articles, directories, blog comments, news sites or PR submission sites. It shows where your competitor is linking to and where you should be focussing your attention to. The linkbuilding part has several nice small features which makes the life of a linkbuilder a lot more convenient. For example you can ad notes to a specific link, you can say in what stage you are with the link (whether you are investigating the link, contacting the page owner, or if they’ve declined your link request). In the linkbuilding part the latest Linkdex feature which I reported on yesterday is stored. This feature shows you the links that have been built within a certain period of time. When Majestic recently announced they were going to have more fresh data Linkdex reacted and makes clever use of that. This type of fresh data makes it game changing. Link building no longer is something you do based on a months old data, but on fresh data, which makes it quicker and more effective. So will this tool improve your rankings? Well no, it’s a tool! And rankings might be automated, improving your rankings cannot. This tool however does keep you alert and let’s you actually monitor what you are doing. It helps you get the rankings if you do what is necessary. And that is what makes it special in my eyes: it really is a tool which integrates your day-to-day job with the optimization part. It is a bit of project management and a bit of SEO with a bit of Link building added to it. This is a difficult one. Many SEOs still like to work with the well know Excel sheets. You can get those sheets out of here, but these SEO’s will still also like the tools like Raventools and others. Linkdex doesn’t make all the other tools unnecessary, but it is a very welcome add on for many SEOs. If one thing I would say this is a great tool for in house SEOs or for companies which do their own SEO. It can even help the companies understand better what their agency is doing and can make sure the agency does the strategic stuff and the in-house some of the actual work. I myself am really excited about this product too (and no they are not advertising (yet 😉 or am I an affiliate (yet either ;)) on this site. It has a low level entry, which is one of the things I sometimes miss in SEO. That doesn’t make the other tools less interesting, or this one better, it makes this one very much fit for a large group of users which really need some help in SEO. If you want to sign up for Linkdex, they are offering 50 ‘State of Search’ readers the chance to experience Linkdex’s ‘Link Timeline’ feature set for 60 days. Get them while you can! Really good review – I agree that it’s ideal for in-house SEO guys to keep their agency in check. Also the whole idea of the task managment and transparency this provides is great across the board – whether your in-house with an agency or and agency with an out-sourced link building team. Hope that helps anyone who was in the same boat as us. Hi, after reading this post I came up with a question: are linkdex and Majestic seo both necessary, because of the first make use of data from the latter? personally in general I would advice to use both yes. Even though Linkdex uses Majestic data, Majestic has a lot more data on its own also, which can provide you with a lot more information. The big question is: can you handle all that data. If not, than using Linkdex is enough, if you can, you will have much more you can use when using both. Thanks for your reply. Now, I’ve another question, what do you exactly mean with “handling”? Do you refer to use data in custom software or more generally to a full understanding of data? I’ve enough knowledge to understand data provided my Majestic but not enough time to create my own software to analyze them. So if linkdex don’t over-simplify data, I think I’ll switch to it. I’d like to know what majestic seo does that linkdex don’t. Can you clarify differences between tools? Majestic gives you data – but does not make any assumptions on it’s interpretation. If a page was there when we crawled it and we have not crawled it again in three years, you’ll only know it’s a dead link when you click on it. By contrast, Linkdex will start to check and verify your data and try to categorize it. Majestic gives you potentially millions of back-links to a given domain, with anchor text and other metrics about the links – but we can only show you what can be shown at scale (2.5 trillion links… we’re not going to revisit them all every day on the off chance you want the data). Linkdex, however, can take our data, then – because you have said you are interested – can re-crawl all of the links we provide to add value. We recrawl the Majestic database when you ask us to look at competitive domain set. Once you have that data you can work on developing link relationships using our Salesforce like CRM system for link building. Wow, I’ve just discovered that Linkdex could be THE software i was looking for… I’ve started the free evaluation today and there are a lot of useful functions. Now it’s soon to give a full feedback but from what I’ve seen linkdex looks really promising. We’ve been using Linkdex since the start of the year and it’s fantastic. The main benefit is tracking. Every time you find a competitor link you move it to a prospects list, add the link and then can block it from ever being seen again as a prospect. Such a time save and you can pass tasks to over people to complete it working in a team on a project. Pingback: Linkdex Adds Ranking Checks For Baidu, Yandex & more - All News & Campaigns.